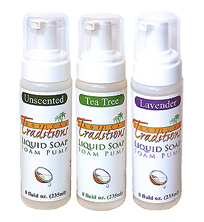 Tropical Traditions sells Organic Liquid Soaps in foaming dispensers! They are made from 100% high quality coconut oil and nothing else. The scents come from added essential oils. There are no fillers or thickening agents so you get more from each container. My family and I have been trying them out for awhile now and our sensitive selves have loved it! 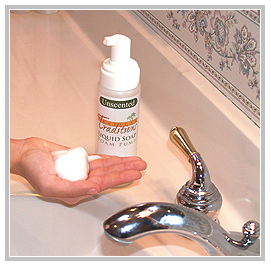 I personally prefer foam hand soaps and love how this brand smells and feels. They come in Lavender, Tea Tree, and Unscented. I usually go for the unscented but I particularly like the Tea Tree smell. Giveaway will end Wednesday January 25th at Midnight MST. Winner will be chosen by Random.org. All information gathered for the giveaway will be discarded when over. Tropical Traditions provided me with a free sample of this product to review, and I was under no obligation to review it if I so chose. Nor was I under any obligation to write a positive review or sponsor a product giveaway in return for the free product. I would like to try Gluten Free Mexican Chocolate Coconut Tres Leches Cake. Yum! kristiedonelson(at)gmail(dot)com Thank you. ooo I'd love to try the Coconut Peanut Butter Cup Hot Cocoa! yum! I'd love to try the Gluten-free Vegetarian "Mexican" Lasagna recipe! I'd like to try the vanilla macaroons. I'd like to try the recipe for Lemon Cranberry Coconut Muffins. The muffins look so good! Lemon Cranberry Coconut Muffins had my mouth watering for one! I'd like to try their Coconut Baked Chicken recipe. Would like to try the Crispy Cheesy Baked Chicken Recipe. I'd like to try their recipe for GF Coconut Cookies! Thanks for the giveaway...we would like to try the Oatmeal Pumpkin Coconut Cookies recipe. I would like the vanilla macaroons. I would like to try the Coconut Cream Hot Chocolate Recipe.